This election year, we've heard the candidates talk about the Constitution and our civil liberties over and over. However, their interpretations of the Constitution often exclude the rights of millions of people in the United States. The American people may be divided between the Tea Party and the Occupy Movement, between the religious right and secular Americans, between Democrats and Republicans... between the 99% and the 1%. But there's one thing that we need to make clear: The Constitution is for the 100%! LGBT Americans and straight Americans. The freedom to marry belongs to everyone and our right to love doesn’t evolve. Women as well as for men; the right to govern our bodies and our health belongs to us and us alone. Immigrants and citizens: human beings can’t be illegal. Everyone deserves to be treated humanely, whether we were born here or not. Protects our liberty as well as our privacy and safety. Being safe and free are not mutually exclusive. Is for one person, one vote, without restrictions or hurdles and regardless of race or background. Is for those of faith and for those who are agnostic or atheist. Freedom of religion applies to all of us and goes hand in hand with the separation of church and state. Sign the pledge and let others know why you believe the Constitution is for the 100%. Submit a message to win one of 500 print-size posters! Get updates on the Fight for Freedom. Sign up for ACLU emails to keep informed and know when to act. When you sign up, we will send you The Preamble, our weekly update on civil liberties and the presidential campaign, and other news and alerts on Election 2012. 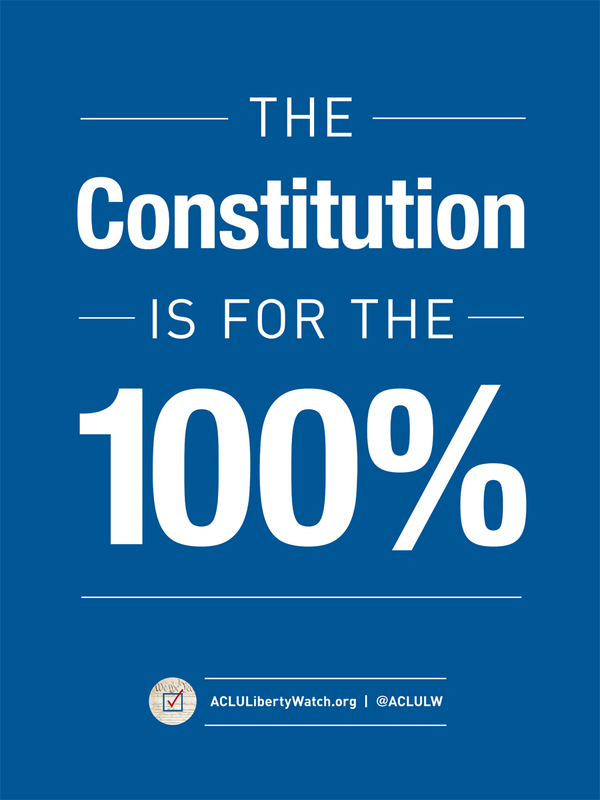 You can also download our “The Constitution is for the 100%” poster and put up in your office, your front window or even on your lawn! View the ACLU Liberty Watch 2012 Privacy Statement and User Agreement. © ACLU, 125 Broad Street, 18th Floor, New York NY 10004. This is a website of the ACLU Liberty Watch 2012 campaign being run by the American Civil Liberties Union. It is not a website of the American Civil Liberties Union Foundation. Click here to learn more. city and state, on our website.